Barbara Aitken shouted to her elementary school students, "Guys, get off the bridge! The train's coming!" The kids were seated on a wooden trestle bridge, dangling their legs over the sides, as a train approached within yards of them. Although reminiscent of a similar scene in the 1980s film Stand By Me, this situation lacked any imminent danger. The train, labeled "Huntington Valley Railway," was one-fifth the size of a real locomotive and moved at 3 miles per hour, giving even the slowest child plenty of time to get off the bridge. 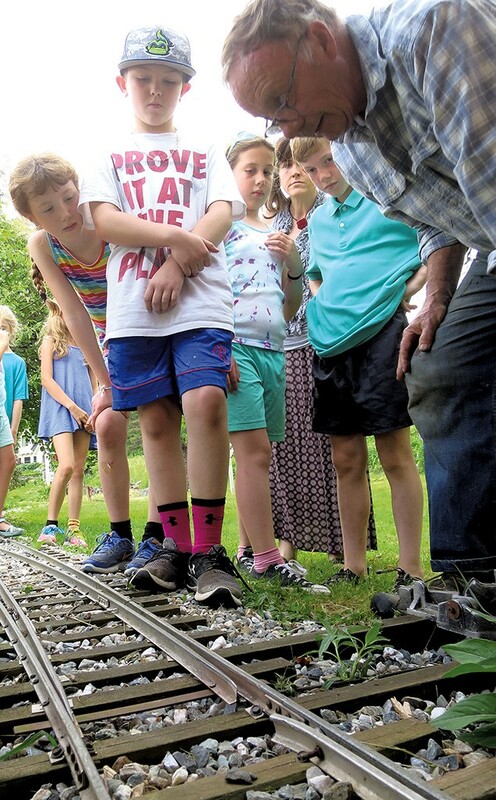 Aiken, a teacher at Huntington's Brewster-Pierce Memorial School, was on a field trip with third and fourth graders to the home of Mark Smith, a lifelong train enthusiast and retired educator. He constructed the miniature railroad mostly from scratch. Smith is known internationally among train buffs for Locomotive & Railway Preservation, a bimonthly magazine he published for about a decade in the 1980s and '90s. Now in his seventies, Smith has been working on the railroad at his home for more than 40 years. A retired psychology professor at the University of Vermont, he still considers himself a "hands-on educator." He views trains as a powerful vehicle for teaching young people about history, science and the value of building things by hand. "The public doesn't watch this railroad," Smith said. "They ride on it and learn to operate it, and they become, for a moment, railroaders." Aitken's students rode with Smith on an engine he modeled after a 1930s diesel locomotive once used around mines and timber mills. Seated in the front of the train, Smith advised his "engineer" — another student — to blow the whistle twice. Four other students and a paraeducator rode along as passengers. As the train rumbled by on 7.25-inch-wide tracks, Aitken explained why she organized the morning field trip. Her class was studying the history of the U.S. westward expansion. Though the educational unit focused more on wagon trains than freight trains, it covered why settlers moved west, the hazards they faced and the effects of expansion on native peoples. The teacher thought that Smith's knowledge of the transcontinental railroad and steam engines would be a valuable addition to that lesson. As she put it, "I couldn't not do it." Smith began the field trip by showing students his workshop filled with locomotives and rolling stock, including a tender car that carries real coal and water for the locomotive, as well as a caboose with a functional woodstove. As the children studied the trains, which sat on rails that connect to the tracks outside, Smith explained the steam engine's role in the Industrial Revolution and how railroads reshaped U.S. history. He also emphasized safety, explaining that even model steam engines can run away, derail, scald the operator or even explode if not tended to properly. When his brief lesson was over, the students ran outside and eagerly raised their hands for a turn at driving the train. Smith and his wife, Marijke, are co-owners of Windekind Farm, a 225-acre property in Huntington on the southern slope of Camel's Hump. The couple is in the process of converting their picturesque farm into an "intentional community" called the Commons at Windekind. The 12-home cohousing development will feature individually owned homes as well as communal property, all of which will be managed according to bylaws based on principles of sustainability and resiliency. 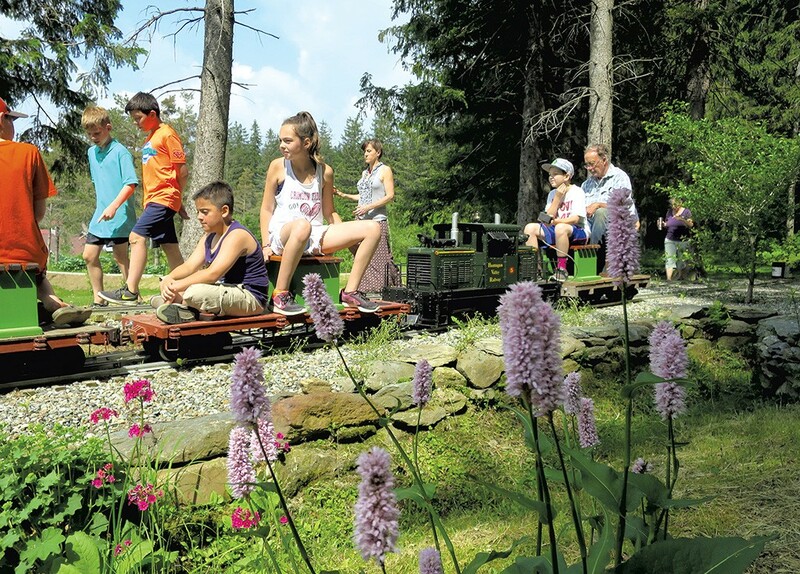 Eventually, Smith's railroad will be part of that shared legacy, including its trestles, sidings, roundhouse, a depot now under construction and more than 3,000 feet of tracks, which traverse a meadow and fern-covered pine forest. The railroad isn't open to the public, but Smith occasionally hosts school groups and other guests, such as wedding parties. The miniature train hobby goes by several monikers, including "outdoor railroading," "recreational railroading" and — Smith's preferred term — "live steam." On the day these students visited, he used a battery-powered locomotive, which uses the same technology as power wheelchairs. Most of the time, however, he prefers driving his steam locomotive, which took him more than five years to build. And though people can ride his trains, Smith emphasized that his railroad isn't an amusement park ride. While he has nothing against them, his miniature railroad is historically accurate in form and function. To that end, Smith modeled a steam locomotive on one built in 1899 by the Schenectady Locomotive Works. Based on historical photos, he included many features — working lights, brake lines, bells, control devices, even the builder's plate and engine number — that were built to scale and historically precise. The wooden trestle that the students played on was designed after those used in early 20th-century railroads. Smith said that when he drives a thousand-pound locomotive over it, the trestle deflects (sags) by only 1/32nd of an inch. Smith first got interested in railroading when he was in grade school. His grandfather, a French immigrant, had risen through the ranks from apprentice to vice president of the Baldwin Locomotive Works in Philadelphia, one of the country's preeminent locomotive manufacturers. Smith grew up in Philadelphia just as the Pennsylvania Railroad was converting all its locomotives from steam to diesel power. Having traveled on steam-powered trains, he was acutely aware, even then, that an important era in railroading was drawing to a close. "I got in the middle of all that," he said. "Being a romantic at heart, I sided with the side that was losing." Outdoor railroading first arose after World War II among hobbyists like Smith who bemoaned the demise of steam locomotives. Many of its earliest adherents were highly skilled machinists, he noted, because the hobby requires a fairly deep understanding of railroad technology and metalworking. Unlike indoor model railroads, a derailment or other mishap of an outdoor railroad is not only disappointing but also potentially dangerous. Smith, a self-taught machinist, began building stream trains as a teen and has continued to do so for 60 years. "It's a way for me to revisit the past with my hands," he explained. "It's not like reading about the past in a history book. I'm there, making it happen, and I'm dealing with the same issues ... that they dealt with." Today, an estimated 25,000 model railroad enthusiasts participate in large outdoor railroad clubs around the U.S. Though Vermont has none, in other parts of the country, especially on the West Coast, some clubs operate enormous miniature railways. The world's largest, Train Mountain in southern Oregon, has more than 36 miles of track spread over 2,205 acres. During large meets, hobbyists from around the world run trains more than 60 cars long. In Huntington, surrounded by curious students and educators, Smith offered an impromptu physics lesson. He explained how smoke going up the locomotive's stack creates a vacuum that draws more gases in, further fueling the fire. "When they were crossing the country," Aitken asked, "did they have to stop and fill up with more water at rivers or something?" Smith explained that each town had water tanks for filling locomotives. In fact, the etymology of "jerkwater towns" or "jerkwaters" to describe remote or unimportant places comes from railroad history. 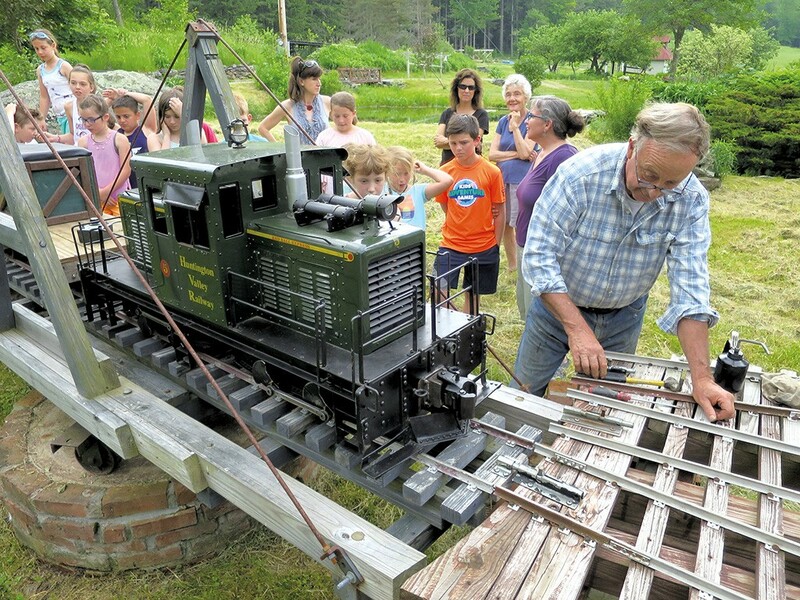 Smith hopes that student outings will spark kids' interest not just in the railroads but also in the skills necessarily to build things themselves. "We're trying to give them some sense of how things work, basically," Smith explained later, "to take the mystery out of it and [make] it everyday." His lesson seemed to have that effect. "I learned how trains work," reported third-grader Phoebe Riggs, who later described the field trip as her "best day ever" at school. "[Smith] taught us about pressure and how when you put water in a teakettle, it goes pfff! and there's a bunch of steam, and the pressure can make it blow up." While some students waded into the Smiths' pond to catch tadpoles and frogs, two fourth graders, Simon Rowe and Lev Dransfield, asked permission to revisit Smith's workshop. As the boys peered inside the locomotive, speculating on where the coal gets shoveled and what each rod and piston does, their fascination with its mechanics was palpable. "Look at the inside of the wheels," Dansfield said. "There are these notches in it, like a rotor on a bike." "Oh, yeah. These steps are cool, too," Rowe observed, examining the locomotive from the opposite side. "I want to get into this." "It's got to be pretty expensive," Dansfield speculated. Indeed, Smith declined to estimate how much he'd spent on his railroad over the decades, except to say that he's sold plenty of railroad memorabilia and train cars he'd built to pay for new additions, something he likened to "selling off your children." But Smith hopes that residents of the Commons will bring a level of financial stability to the railroad as well as a hands-on interest in keeping it rolling even after he's reached the end of the line. However, he is less concerned about his own legacy than about teaching what the railroads once symbolized for this country. "With the decline of manufacturing and making things, America has lost something very significant," Smith said. "I think that explains some of the alienation and anger in the heartland, because those people and those jobs — the steelmakers, the railroad workers, the locomotive builders, the shipwrights, the airplane manufacturers — made wonderful things. I just want this country so badly to re-create that environment." The original print version of this article was headlined "Making the Grade"